This recipe combines fruit, yoghurt, and cream in a tempting dessert. My kids just love the mint and fruit combo! This is a sweet, nutritious, and delectable addition to any meal. 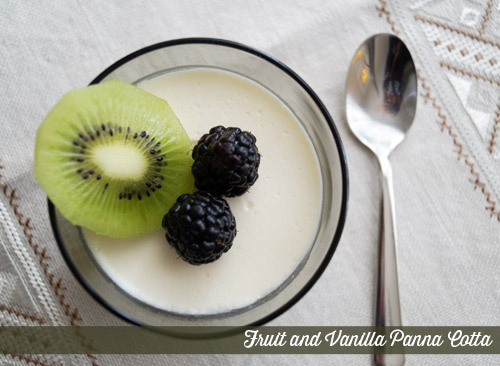 If you like the taste of vanilla, you can't help but love this fruit panna cotta. You need simple ingredients and it takes no time to put together. The blackberries and kiwi release delightful and rich flavors. This is a refreshing treat that everyone likes, and I always double the recipe. It is definitely a hit with adults and kids alike. Mix water and gelatin in a bowl and leave aside for 10 - 12 minutes. Mix sugar, vanilla bean and heavy cream in a saucepan on stovetop. Add a pinch of salt. Remove from heat when it starts to simmer and pour the gelatin mix over the cream. Combine well and divide into 6 dessert cups. (Wet the dessert cups with water to help release the panna cotta when you are ready to serve). Place in the fridge for 2 - 3 hours or overnight. Serve with sliced blackberries and kiwi or with mixed berries and garnish with fresh mint. You can also garnish with unsweetened chocolate and almonds or nuts.